Two Jewish youths suspected of involvement in deadly Duma arson indicted on murder charges Sunday morning. Indictments were filed on Sunday morning at the Lod District Court against two Jewish youths suspected of involvement in the deadly arson attack in Duma five months ago. They have been identified as 21-year-old Amiram Ben Uliel from Jerusalem and an unnamed 17-year-old from elsewhere in Samaria. Ben-Uliel was charged with three counts of murder, while the minor was charged as an accessory to murder. According to the indictment, the two defendants decided in July 2015 to conduct a revenge attack for the murder of Malachi Rosenfeld, which occurred near Duma. Ben Uliel and the minor met at the Geulat Hatzion outpost several times to discuss targets, eventually settling on a double attack in Duma and the neighboring Majdal village. They agreed to meet at the Yishuv Hada'at outpost on the night between July 30 and 31 to carry out an attack in Duma "with the intention of killing people in their houses." Armed with two bottles filled of flammable liquid, rags, a lighter, a matchbook, gloves and black spray paint, Ben-Uliel arrived at the designated spot at 11:00 p.m. on July 30. When the minor failed to arrive at the designated meeting place before the attack, Ben-Ulliel, after waiting an hour, set off to conduct the attack on his own. Ben-Uliel tied one of his shirts around his face and crept into Duma. In an effort to increase the damage, he chose two houses in the center of the village - both belonging to different members of the Dawabshe family. 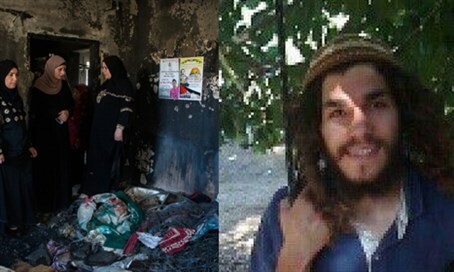 After preparing the firebombs in the Dawabshe's yard, Ben-Uliel spray-painted a Star of David and the words "revenge" and "long live the Messiah" on a wall near the houses. He threw the firebombs through unlocked windows into the houses before fleeing on foot. Eighteen-month-old Ali Saad Dawabshe was killed in the ensuing blaze and his parents were fatally injured. His four-year-old brother was the sole survivor from the immediate family. Two other Israelis, including a minor, were charged for implication in "other terrorist acts" as well as obstruction in the Duma case. These included the arson attacks on the Dormition Abbey in May 2014 and the Church of the Multiplication in June 2015, as well as acts of vandalism on Palestinian Arab property. Attorney Itamar Ben-Gvir, who is representing one of the suspects, slammed the indictments, asserting the case was far from over and that the Shin Bet had "opened a Pandora's box." "I suggest the Shin Bet not rush to celebrate," he added, noting several different high-profile cases in which "the system did everything to prove a crime even at the price of criminalizing innocent people." "My clients are innocent, my clients have not confessed to the police! Only through torture did they break during Shin Bet interrogations," Ben-Gvir stressed, noting the abuse he clients underwent made their confessions inadmissible.